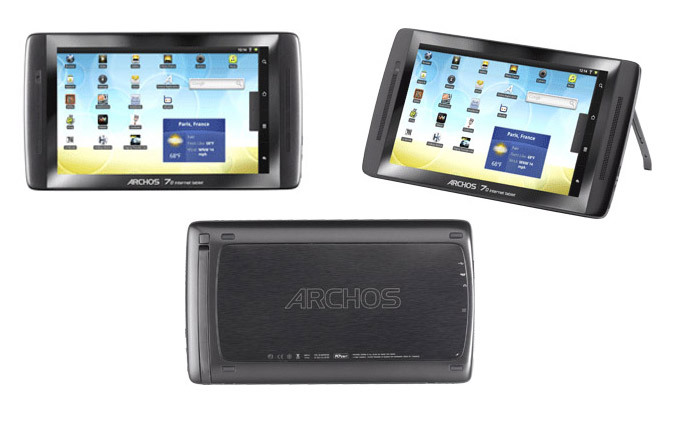 Archos 70 internet, android based tablet is now available for purchase from Archos’ website. The slim device measures 201 x 114 x 10 mm(+4mm thick for Hard Drive version) has a 7.0-inch 800×400 capacitive multi-touch display with a g-sensor and will coast you $275 if you get the 8GB flash storage model. The tablet runs Android 2.2, powered by 1GHz ARM Cortex A8 processor,has a a 3D OpenGL ES 2.0 graphical accelerator, 802.11 b/g/n WiFi, Bluetooth 2.1, a microSD slot, USB port, HDMI output, a front-facing VGA camera and a Lithium Polymer battery, that is capable to deliver music playback time up to 36 hours, video playback up to 7 hours and web surfing up to 10 hours. The 250GB hard-drive model will cost you $349.99 here.